I think they have this wrong. 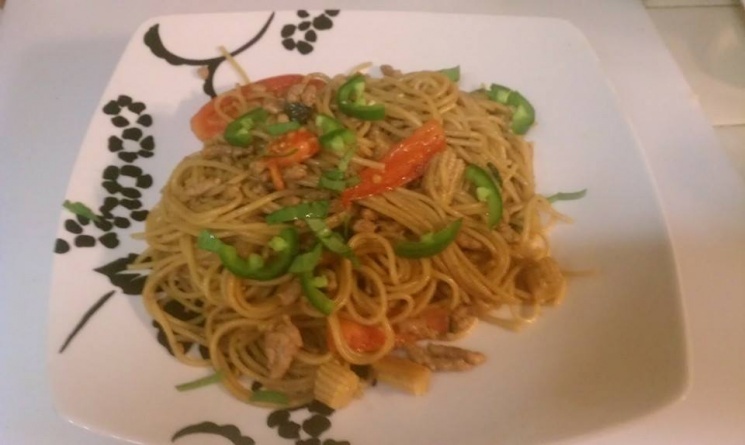 If you make this to the Recipe you will be Kee Mao before your tongue gets its feeling back. Needs a lot of beer but didnt stop me from having 2nds. To Anonymous. Make sure you are using Black Soy sauce offered on import foods. Not regular soy sauce. Black Soy sauce is not salty but more like the taste of molasses. Hot water on dried rice noodles? It always ruins mine. I put them in cold water until soft (hour or more, time not critical) drain, toss with tiny bit of oil, and drain longer, and add to stir fry. My girls would invite friends to bring an assigned veg and then they would chop and prepare for quite a while and then stir fry the feast together. 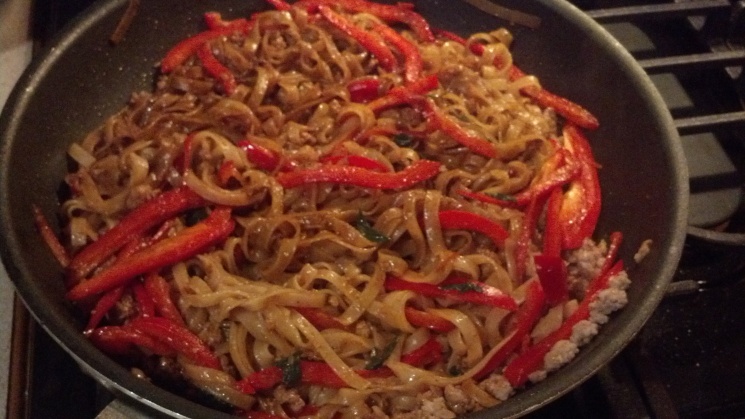 Not really drunken noodles but embellished to the max. High schoolers having great clean fun and everyone had a sense of accomplishment. My daughters were celebs. Precious memories for this dad. Way too much black soy sauce....it was overpowering! My first attempt and my husband (who is very practiced in Thai cooking) said he loved it. I will be making it again. I did cut chilies to using 6 Thai chilies and cut the fish sauce just a little but everything else I kept the same. Tasted better than the local restaurant down the street from me. Do not substitute any basils for the Thai. Try to find "Holy basil", it's much spicier than other basils. 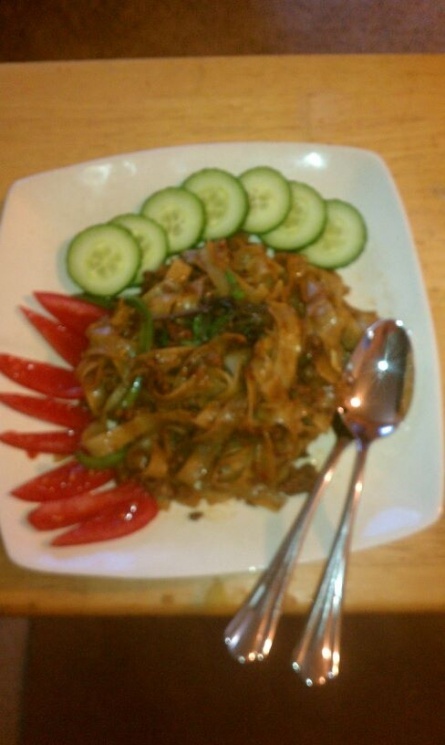 You're not really having Pad Kee Mao otherwise. And, as Mike says above, black soy sauce is very different from your typical "Kikkomans". In Asian markets it's sometimes called sweet soy sauce. Golden Mountain sauce is like Filipino Maggi seasoning and, IMHO, 1/4 cup would be too much. None of this is written in stone, experiment, as the street vendors surely do. Try Hoisin sauce instead of black soy, add veg, more fish sauce ! But it's gotta be Thai basil. Good luck ! I love this recipe! 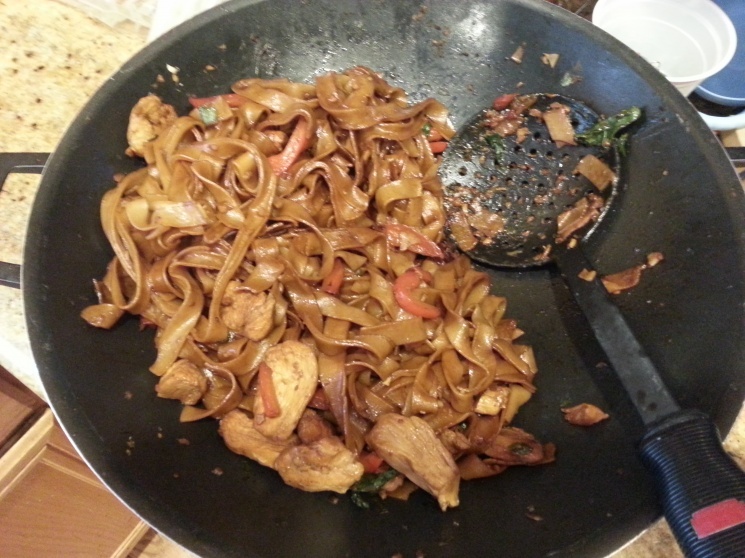 I only use 2 Tbsp of the black soy sauce and I use fresh noodles. Everything else, I keep the same. I can't remember the last time I ordered out for Thai food, it's so easy and delicious to make at home. Oh, I also add scrambled egg to mine. Thanks Import Foods, you rock!!! I didn't know dark soy sauce is different than regular soy sauce. I made it two bags noodles which it is too much. one bag is more than enough. It barely fit into my wok and I do have a good size wok. I found the dish has too much soy taste. I don't think I will again. I am not Thai so I do not know what I'm doing and this was my first attempt at this recipe. I personally thought it was WAY TOO MUCH fish sauce. I tend to like the more american Thai food, and when I order Thai spicy noodle from my neighborhood restaurant, you do not smell fish sauce. It's in there, but you can't taste it or smell it. So why did my whole house smell like fish sauce and that was the only thing I can taste? What did I do wrong? I used the exact ingredients in the recipe. It was still good though. I used two big Thai chilies and that was not spicy enough. I will try again and cut the fish sauce in half. I LOVE this recipe!!!!! I made it just as written - being sure to use the black soy sauce suggested and golden mountain sauce (NOT your typical kikkoman soy sauce). 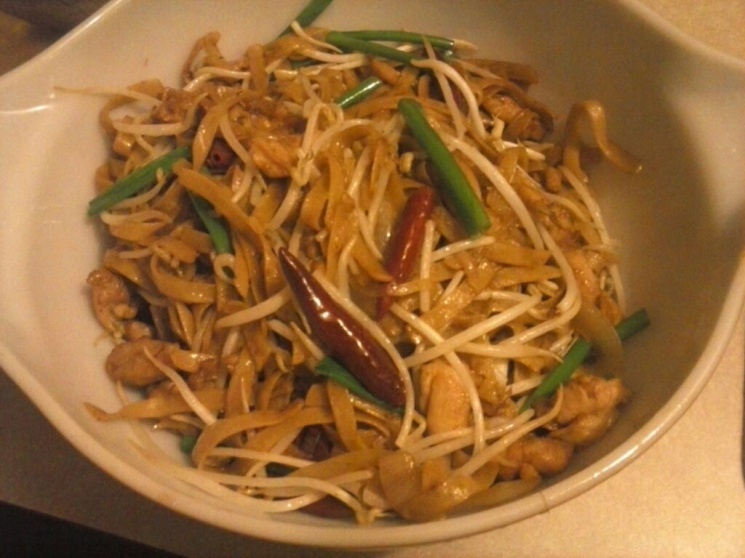 We don't like foods too spicy, so I used only 3 thai chilis and took most of the seeds out. Even then it was pretty spicy, but SO delicious! I soaked my thick dry rice noodles (XL) in hot tap water for about 30-60 minutes. (I have tried soaking thick rice noodles in boiling water - don't do it, sticky mess!) Then I boiled them for only about 1 minute, until they were soft but still had a bite. I drained them and rinsed in cold water, then set back into a bowl of cool water to set until I was ready to use them. Also, if you boil them dry without soaking first they will stick together terribly! Twelve garlic cloves seems like a lot, but it's not. This makes a LOT of food. Enough for 6 adults I'd say. 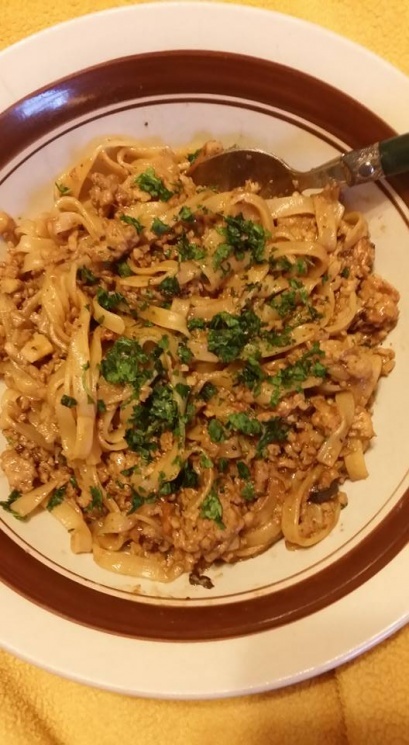 I really liked using ground chicken. I did add the peppers to the chicken early so they could soften a bit before adding the noodles and tomatoes. You also don't want to cook the tomatoes very long or they turn to mush - you're just warming them up really. And don't skip the basil! Can't wait to make this again. Thank you Import Foods!!!! !